5793 labyrinths found. Showing 4421-4440. Sorted by country, state, city, then zip/postal code. 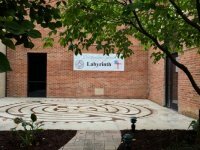 The labyrinth is located in Bodwell Hall and available to be walked whenever the church is open (generally M-F 9 am - 5 pm and some evenings, as well as Sunday 9 am - approximately 2 pm) Call first to insure that Bodwell Hall has not been previously reserved. Labyrinth is located behind the Eastside parking lot in an open yard. Situated in the Lane Avenue Gardens - see website for details. 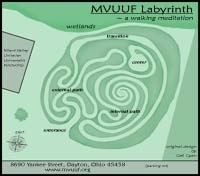 A labyrinth is featurd at the annual Universal Light Expo - held in Columbus OH - visit our website for details. We also have a portable canvas labyrinth available for borrowing on a case by case basis. Contact us for more details. Please note: the site is currently closed through 2018 during new building construction. We are located on First St. between Wilkinson and Perry. Enter through the second set of doors on Wilkinson St. and follow the signs. The first Tuesday of each month from 12:00 pm - 7:00 pm. Outdoor and open to all 7/365 via the public sidewalk on West First Street. Site lit until late evening. I 75S to US 35E - US 35E to Woodman Dr. Exit (SR835) - Right off the exit onto Woodman Dr. - Woodman Dr. to Research Blvd. (Patterson Rd.) - Left on Research through two traffic lights. At second light, continue straight onto Shakertown Road - Bergamo Entrance is on the Left: 4400 Shakertown Road. From the North - 675s to exit #2, turn left. 8690 Yankee Street. Labyrinth is on the right side of the Church. Original design by Gail Cyan. Center has benches for resting and overlooks a beautiful wetlands. Located between Merrick Hall and the Delaware Run. Open 24 hours. On campus. 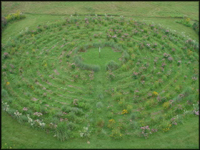 Open labyrinth walk the first Wednesday of every month 6pm to 8pm.